JOHOR BARU: Iskandar Investment Bhd (IIB) will be awarding six construction packages with a total value of RM250mil to successful bidders by the end of the month. President and chief executive officer Arlida Ariff said the packages were mostly for the actual construction work on the buildings related to the IIB strategic projects in Nusajaya, including work on facilities for the University of Newcastle Medicine Malaysia Campus (NUMed) in EduCity, the Marlborough College in International Resort and the Legoland Theme Park in Medini. “Our planned catalytic projects within the Nusajaya development zone are progressing well and ready for completion as scheduled,” Arlida told StarBiz. Nusajaya, spanning 9,307.76ha, is one of the five flagship development zones in Iskandar Malaysia. The others are the JB City Centre, Western Gate Development, Eastern Gate Development and Senai-Kulai. 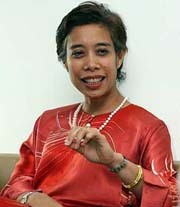 Arlida said the RM300mil NUMed campus on a 5.26ha site in the 123.42ha EduCity was scheduled for completion in May 2011, and the Marlborough College should open in September 2012. She said Asia's first RM700mil Legoland Theme Park would be the centrepiece of the 230.67ha Medini North, which was expected to open in April 2012, a year earlier than planned. She said earthworks for Legoland were under way while work on the buildings and attractions in the theme park would start in the third quarter of the year. The development of projects in Medini is undertaken in partnership between the private and public sectors. The key investors include IIB, Mubadala Development Co, Aldar Properties, Kuwait Finance House and Millennium Development International. The overall development of Medini is divided into four distinct zones with separate themes - the Lifestyle and Leisure North, the Financial District, the Medini Central and Lifestyle and Leisure South. Arlida said IIB and the Iskandar Regional Development Authority were accountable for the success of Iskandar as they were answerable not only to Johoreans but also all Malaysians, as the growth corridor would benefit the whole country. IIB is backed by Khazanah Nasional Bhd, which holds 60% equity, while the Employees Provident Fund and government-linked company Kumpulan Prasarana Rakyat Johor Sdn Bhd each has 20% equity. The Selangor State Development Corporation (PKNS) has embarked on the redevelopment of old residential and commercial sites in Selangor to take advantage of their prime locations. Its general manager, Othman Omar, said the corporation had identified 16 locations in the state to be redeveloped over the medium and long term. "For a start, it has embarked on redevelopment of Pusat Bandar Keramat near the Jelatek LRT station in Kuala Lumpur," he told a briefing after signing a memorandum of understanding between PKNS and Bernama for the supply of news and information in Petaling Jaya today. Othman signed on behalf on PKNS and Bernama general manager, Hasnul Hassan, signed on behalf of the national news agency. Also present were PKNS deputy general manager Md Nasir Md Arshad and Bernama editor-in-chief, Datuk Yong Soo Heong. The new development at Pusat Bandar Keramat, which will have a gross development value of RM1.3 billion, will be known as Datum Jelatek and will comprise residential and commercial properties, including a shopping mall and recreational facilities. Othman said the redevelopment included providing compensation to the previous residential and commercial owners. He said the objective of the redevelopment was to leverage on the prime locations of these areas and for PKNS to provide better amenities to the residents. "Our old apartments used to be single room or studio types. Under our new development, we intend to provide more for the residents," he said.